The US President is due to vist the area later today. 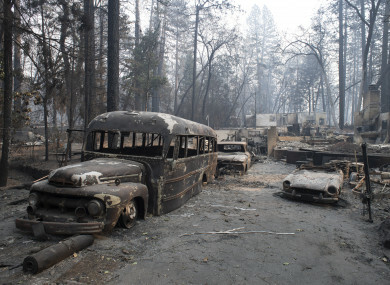 Burnt vehicles in Paradise, California. THE NUMBER OF people listed as missing in a devastating northern California wildfire soared past 1,000 yesterday as the remains of eight additional victims were found by rescuers. Butte County Sheriff Kory Honea told reporters that the number of people unaccounted for had jumped from 631 to 1,011 in the last 24 hours as authorities receive more reports of people missing and as emergency calls made when the fire broke out are reviewed. He said that on a positive note, 329 people who had been listed as missing since the fire broke out had so far been accounted for. “The information I am providing you is raw data and we find there is the likely possibility that the list contains duplicate names,” he said, adding that some people who had escaped may also be unaware that they have been listed as missing. The eight additional sets of human remains found bring to 71 the total number of dead from the so-called Camp Fire, the deadliest and most destructive in California history. The inferno erupted 8 November, laying waste to the town of Paradise at the northern foothills of the Sierra Nevada mountains and sending thousands fleeing. President Donald Trump is set to visit the region on today to survey the damage and meet victims of the fire that has devoured an area roughly the size of Chicago. In an interview with Fox News ahead of his visit, Trump doubled-down on his earlier claim that mismanagement of California’s forests was to blame for the fires. But he acknowledged that climate change may have contributed “a little bit” to the wildfires. Authorities said the Camp Fire has burned 146,000 acres and was 50% contained. They added that 47,200 people had been evacuated because of the fire and nearly 1,200 were living in shelters. Smoke from the fire forced the closure of public schools in San Francisco on and the shutdown of the city’s iconic cable cars as the Air Quality Index soared to 271, comparable to Dhaka, Bangladesh and worse than Kolkata, India. “San Francisco’s air quality has moved from red or ‘unhealthy’ to purple or ‘very unhealthy’ due to local wildfires and weather patterns,” the SFMTA transport authority said on its website. A blanket of haze enveloped the region and the Golden Gate Bridge was shrouded in thick smog. “It’s bad,” said local resident Melvin Karsenti. You have this constant haze over the city. The air feels thicker. I’ve never seen that many people wear (face) masks. Authorities said they expect air quality to remain poor until Sunday, when winds are supposed to pick up. Forecasters are also predicting rain from Wednesday, which should help the thousands of firefighters battling the flames. Much of the rescue work is now focused on Paradise, a community that was home to many retirees who found themselves unable to get out in time. Hundreds of rescuers, backed by sniffer dogs, have been conducting a painstaking house to house search, as authorities collect DNA from relatives of the missing to help with body identification. “I’m still going to keep on looking and hope for the best,” Jonathan Clark, who was hunting for his brother, sister-in-law and nephew, told AFP. “My dad is starting to lose hope a little bit,” he added. Three other people have died in southern California in another blaze dubbed the Woolsey Fire, which engulfed parts of Malibu, destroying the homes of several celebrities. That inferno, which is about two-thirds the size of the Camp Fire, was close to 70 percent contained by Friday, as authorities predicted they would have it under control by Monday. Many of the victims of the Camp Fire have been housed in temporary shelters and are facing homelessness as they try to rebuild their lives. Adding to their misery, an outbreak of the highly contagious norovirus has been reported at several shelters. Public health officials said 41 people had been sick with vomiting and diarrhea as of Wednesday evening and 25 had to be hospitalized. While the cause of the Camp Fire is still under investigation, a lawsuit has been filed against the local power company, PG&E, by fire victims claiming negligence. Email “Over 1,000 people now missing in California wildfires as Trump doubles down on blame game”. Feedback on “Over 1,000 people now missing in California wildfires as Trump doubles down on blame game”.